Kierkegaard, who had been working up an abandoned project on the three great medieval figures of Don Juan, Faust and Ahasuerus (the wandering Jew) incorporated much of the work he had done into Either/Or. The literary characters that most influenced Kierkegaard were Don Juan (representing pleasure), Faust (doubt) and the Wandering Jew (despair); he used characters based on them in his writings. For example, both Don Juan and Faust personify the demonic in Kierkegaard’s Either/Or, Part One .. This entry was posted in literature, theory on November 29, 2006 by jahsonic. This entry was posted in literature, modernism on November 29, 2006 by jahsonic. Frédéric Soulié is another writer of the roman frénétique. In his time he was as well known as Balzac or Eugène Sue. 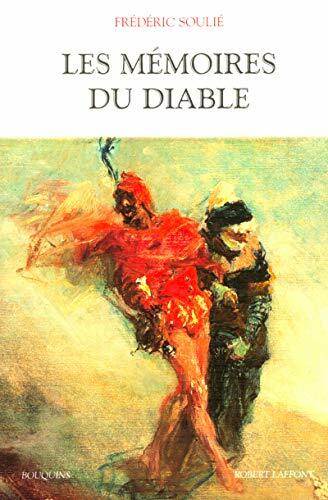 His Les Mémoires du diable (1838) is mentioned in Colin Wilson’s Misfits and the Romantic Agony. Who knows who did the painting on the Robert Laffont edition shown above? It looks like something done by Daumier. This entry was posted in fiction, grotesque, horror, literature on November 28, 2006 by jahsonic. 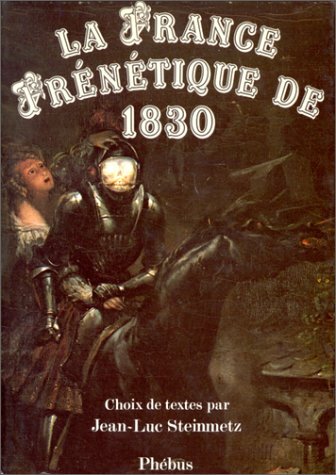 Inspired by The Romantic Agony, I bring you some 19th century cult fiction by the likes of Jules Janin and Charles Nodier of the “frenetic school”. This story features probably the most nauseating narrator in the entire history of literature. In nineteenth century France there flourished a literature of horror on a par with the English Gothic novel or the German Schauerroman. It was christened ‘the frenetique school’. The frenetique was at its peak in the late 1820s and early 1830s. Of this short-lived literary movement Jules Janin’s The Dead Donkey and he Guillotined Woman is one of the finest and certainly one of the most unpleasant examples. Jules Janin is supposed to have begun the tale as a spoof of the fashionable frenetique style. However, with its wealth of horrible incident and its sinister and claustrophobic atmosphere, it seems likely that the author actually fell in love with his subject. The bizarre duality of the novel is one of its most striking qualities. In the category of “la littérature frénétique”, most frequently cited are Jules Janin, Charles Lassailly, Charles Nodier (Smarra, or the Demons of the Night (1821)) and Pétrus Borel. Its peak was the late 1820s and early 1830s. Every European country had its own terminology to denote the sensibility of the gothic novel. In France it was called the roman noir (“black novel”, now primarily used to denote the hardboiled detective genre) and in Germany it was called the Schauerroman (“shudder novel”). Italy and Spain must have had their own, but I am unaware of their names as of yet. This entry was posted in genre, grotesque, horror, literature on November 27, 2006 by jahsonic. Last night was the night when the wind came and changed autumn into winter, taking with it all the leaves that crowned the trees. 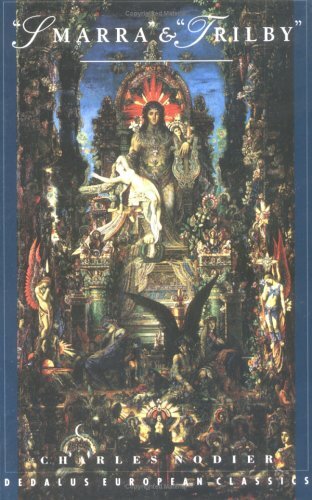 I’ve added a list of protagonists and themes/tropes to the page dedicated to Praz’s Romantic Agony, a remarkable book, especially considering that it was written during the late 1920s, when the decadent movement wasn’t even cold yet. As far as its quality goes, it is way up there with Todorov’s The Fantastic, Colin Wilson’s The Misfits, Ludwig Marcuse’s Obscene and André Breton’s Anthology of Black Humor. Definitely one of my favorite works of literary criticism. Todo: the thematic criticism of Jean-Pierre Richard (Littérature et Sensation, 1954) and the Geneva school as it applies to the works above. See theme. Maybe start here; or with Horst Daemmrich Themes and Motifs in Western Literature and with the criticism by Todorov on Richard? This entry was posted in fiction, literature, theory on November 26, 2006 by jahsonic. The Gothic novel, which flourished from about 1765 until 1825, revels in the horrible and the supernatural, in suspense and exotic settings. This volume presents three of the most celebrated Gothic novels: “The Castle of Otranto“, published pseudonymously in 1765; “Vathek” (1786); and the story of “Frankenstein” (1818). Introduction by Mario Praz. 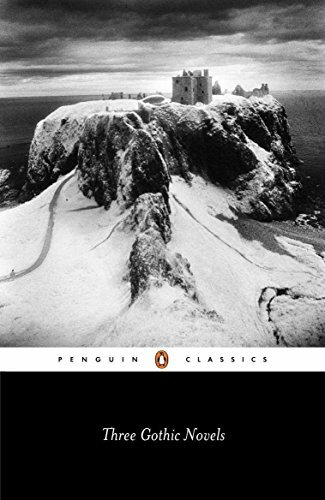 The cover image of this Penguin edition illustrates one of the main tropes of gothic fiction: the isolated and haunted castle. This entry was posted in fantastique, fiction, genre, grotesque, horror, literature on November 25, 2006 by jahsonic. “[The] case of Baudelaire’s exotic exclusiveness will be understood, and of his strange conduct towards Madame Sabatier, and it can be why so many people give credit to the rumour reported by Nadar. (Baudelair’s impotence, generally admitted in this case, is denied by Flottes. )” pages 153 and 187 of The Romantic Agony. It seems that I was wrong about Praz’s ‘panning’ of the decadence of late romantic literature. In his introduction Praz that it is his aim to describe the what-is-ness of this sensibility (morbidity and perversion) in romantic literature. This entry was posted in eroticism, fiction, grotesque, horror, life, literature on November 25, 2006 by jahsonic. Noiret in good company, I believe the lady on the left is Jeanne Moreau. Photo credit unidentified, sourced here. As you reach middle age, actors, singers and other artist whose work you’ve followed start to die. Most recently it was Philippe Noiret’s turn. His peephole closed last Thursday. Noiret debuted on the screen in 1956 in La Pointe Courte by Agnès Varda, but was not cast again until 1960 in Zazie dans le métro. After that, he became a regular on the French screen, without being cast in major roles untill the late 1960s. Noiret first came to my attention in 1984, in the French film Les Ripoux (English title: My New Partner). A story about a veteran cop who sees his habits disrupted by his new partner. (co-written by real internal police officer Simon Michaël) My first unconscious exposure to Noiret must have been the famous 1969 heist movie Topaz which our father encouraged us to see in the early seventies. I recently saw him perform in the 1969 art-agit film Mr. Freedom by William Klein and Zazie (his performance was superb). He shone in such films as Coup de Torchon, the 1981 French film adaptation of Jim Thompson’s 1964 novel Pop. 1280, directed by Bertrand Tavernier; in the legendary La Grande Bouffe (1973) by Italian director Marco Ferreri; and perhaps most of all in one of my all time favourite films: Life and Nothing But (1989), again directed by Bertrand Tavernier where Noiret turns in an unforgettable performance as a French Army Officer given the thankless task of uncovering the identity of all the dead of the post World War One battlefields (and falls in love with the character of Catherine Deneuve in the process). He also starred in two feelgood films of the late eighties and early nineties: Nuovo Cinema Paradiso (of minor interest because of its the famous ‘kissing scenes‘ montage near the end of the film) and the sentimental comedy Il Postino (the story of real-life Chilean poet Pablo Neruda ). This entry was posted in film, life on November 24, 2006 by jahsonic. After cleaning up my American erotica and American exploitation pages, I stumbled upon this quote from http://beautyindarkness.blog.ca/, on which Jay Gertzman himself comments with a link to American Fetish – a forthcoming book by Robert V. Bienvenu II, Ph.D. But what happened in kink in the Interwar period? There’s the Weimar Republic of Germany, as documented by Mel Gordon’s [correction mine] Voluptuous Panic. I also want to work in William Charles Moulton and his creation, Wonder Woman. And what else? This entry was posted in eroticism, exploitation on November 23, 2006 by jahsonic. This entry was posted in art, grotesque on November 22, 2006 by jahsonic.